During the procedure, an applicator is applied to the treatment area and you will feel some cold and pressure. There is no need for anesthesia or pain medications and most patients read a book, listen to music, watch television or sleep during treatment. You can resume daily activities including work and exercise immediately following the procedure. Some patients can experience temporary redness, numbness, and bruising. Each treatment can result in a 20%-26% reduction of fat in the treated area. Further fat reduction can be attained with additional procedures. As long as you maintain your weight the result will be long term as this procedure eliminates fat permanently. 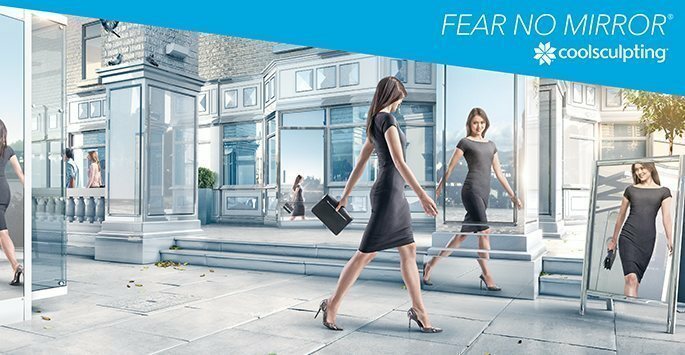 Click through the image here for an interactive tour of our CoolSculpting® treatment room. 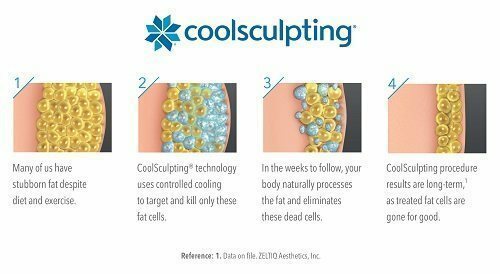 CoolSculpting® works best for pockets of fat that have not responded to a healthy diet, exercise, and lifestyle. The most common areas being treated are love handles, upper and lower abdomen, mid back and bra line. The FDA has approved this procedure for treating fat cells in the abdomen and flanks, which are also referred to as the love handles. Other areas (off-label) that can be treated are back fat and medial thighs. The skin may be tender to touch in the area where fat cells were frozen. Light bruising and swelling might also take place. Patients can sometimes notice numbness and tingling for a few days afterward. Performing only light activity can help people manage these symptoms. Most people notice results in about six weeks, with continued improvement occurring over a few months. Will more than one treatment be needed? That depends on the amount of fat that needs to be removed and the patient’s individual goals. Who should not have CoolSculpting® performed? Those who are obese may need to lose a great deal of weight before having this procedure. Abdominal hernia patients should discuss any ongoing treatments or medications with their surgeon first to rule out any conditions that might cause complications. CoolSculpting® permanently removes fat cells, but the results need to be maintained by the patient by keeping a healthy lifestyle. Those who find that diet and exercise alone do not give them the shape they desire may want to consider CoolSculpting®. It has been proven to be a safe and effective alternative to liposuction in many cases. Skin rejuvenation treatments are considered to be elective, so most insurance providers won’t cover the costs. To help make CoolSculpting® affordable and accessible for everyone, Supriya Aesthetic Dermatology offers financing options via CareCredit®. We also accept cash, personal checks, and major credit cards. Contact us today if you have any questions about the cost of CoolSculpting®. Patients interested in a consultation can contact us at 561-805-9399 to make an appointment.